What if we reseeded the 2018 California State XC meet? 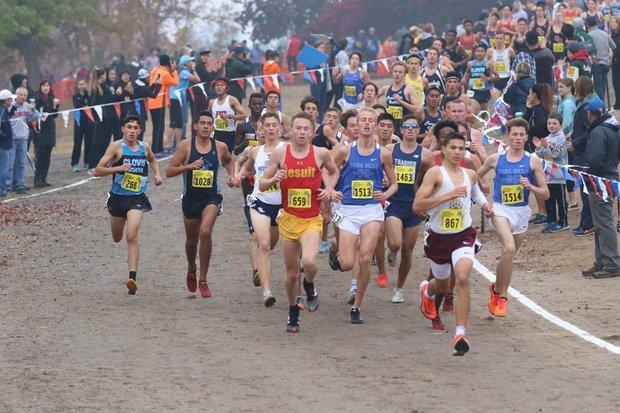 The 2018 California State XC meet seems like a distant memory and before we are headlong into the 2019 Track and Field season, I would like to take a closer look at the results of the most recent state XC meet. The first state meet was contested at Woodward Park in 1987 with three divisions. A fourth division was added in 1990 and the current format with five divisions was finalized in 1996. The divisional breakdowns have fluctuated since that year as mandated by the CIF and at this moment, each section is given autonomy on how they place their teams. The one variance is that Division V teams cannot exceed 600 students. Since all sections are not created equally as in size, what we end up with is a large disparity in the rest of the divisions as you will see below. The data you will see below was accumulated by Jesuit coach, Walt Lange. He has been one of the most successful distance coaches in California and his boys have won 9 state team titles during the state meet era. Coach Lange was also one of our coaches that we profiled in our California Coaching Legends series. You can check that profile HERE. Below you can see the actual boys team results of the 2018 CIF State Meet on the left while the stats on the right show the results if all sections used the same numbers for all divisions. (You can also view the stats you see below at this LINK if you want a cleaner version.) The Section links will take you to each section's divisional breakdown if you wanted to do your own research. By reshuffling the teams after their section meets, you would now get equitable competition in all divisions. The teams that have been dominant over the years are usually the result of taking on smaller schools. How many of you knew that the Division III state champion team (Ridgeview) had 2532 students? The Division II state championship team (Newbury Park) is listed with 2452 students and while it is smaller than Ridgeview, Newbury Park would be in Division I in any other section. By holding all sections to the same divisional breakdowns, this would eliminate this type of disparity. If you have any comments about the following stats, feel free to use the comment section below or chat at us on twitter @milesplitca.